Washington DC is going through spurts of change, especially in certain neighborhoods in this small district. I have been living in my adopted city since my arrival for graduate school, and I have seen the changes in various parts of the city, from the squalid days of the 80’s crack years to today’s prosperous times especially in neighborhoods that have gone through some serious gentrification. 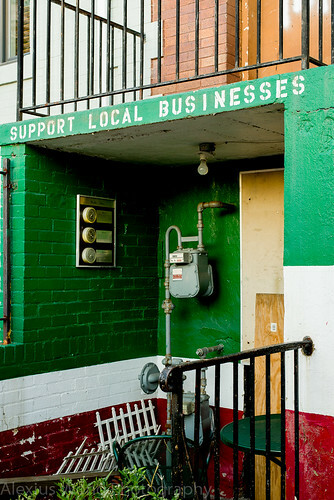 One such neighborhood is Columbia Heights, an area once known for its high density of immigrants mainly from Central America. Walking around Columbia Heights metro stop these days, one can’t help but marvel at the swanky condo buildings and shopping centers that were not in existence not too long ago – one could assume its mistaken identity with such drastic changes. I faced such mistaken identity when I bought some online coupons for a taco place, thinking that it was a high-end Mexican restaurant that I had been waiting to do a review on, confusing the order of the words in the name. Oh well, with such fate in the coupons, I looked up the online reviews, which built up some anticipation in me to visit this low-key establishment. 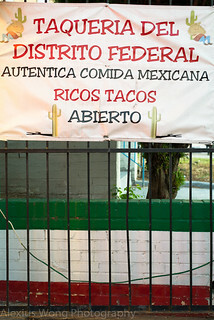 Taqueria Distrito Federal is located about half-mile from the above-mentioned metro stop. 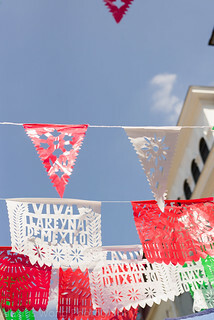 Heading north, one notices the effects of gentrification petering off as the buildings look more aged and the din of the streets pulsating with rhythmic lilts of salsa and merengue, in addition to a growing density of Latinos and less of the gringo. TDF is on the ground level of what looks like a townhouse with a small patio area for al fresco dining, prime dining property compared to the rather cavernous inside. 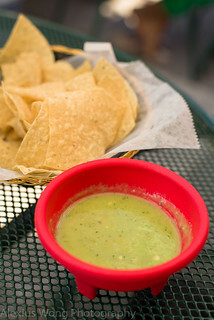 Once seated, I was regaled with a bowl of creamy green salsa with some thin fried nachos. Not thinking much of the usual pedestrian offering, I took a small bite while I was perusing the menu. Immediately, I sensed that this was a different type of salsa. My investigative tongue was analyzing the interesting notes, coming up with a slightly smoothness from the avocado, some front-mouth heat from jalapeño peppers, herbaceous from a hit of cilantro, and tartness from a good dose of lime juice (not so limey, unfortunately, on another visit). Before I knew it, I was making some dent in the basket of chips which supported the limelight (pun intended) on the salsa. The drink offerings were the perfect accompaniment to the nachos. On one visit, it was Jamaica, Hibiscus flower water, with its slight floral notes and its soft berry-like puckeriness. Another visit’s liquid was Marañon, Cashew fruit juice, which I appreciated for its unique fruitiness with a gentle tannin-like quality. 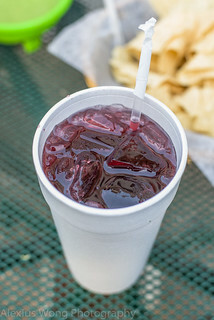 In addition, other drinks are the usual Mexican/Central American offerings of Horchata, Tamarindo, and Jarritos (Mexican sodas made with REAL sugar). Authenticity definitely starts here indeed. The menu offers primarily Mexican street-fare that are relatively small bites. I could not help but zone in on the Tostadas, and on one visit, the topping of choice was fish. The crispy fried corn tortilla was nice and crispy, strong enough to support the layers of slightly smokey mashed black beans, the fish, a handful of crisp lettuce, and a slathering of light crema, Mexican sour cream (less sour than the usual) along with shaved mild Mexican cheese. But what really got my attention was the fish that was cooked firm but the right texture for this dish and tasting well-seasoned. I was curious to what type fish was being used, guessing Red Snapper. The waitress said it was Tilapia – seriously? There was no hint of the dreaded muddiness sometimes associated with the fish, and I was enjoying every morsel of that sea protein. This was definitely delicioso especially given that it was that fish of choice. Another trip’s order was made with shrimp which was not so exciting for the red bean paste was a bit flavorless and the shrimp not as tasty as the fish version. Other versions can be ordered with different meat topping but seafood is the way to go for me with this crispy tortilla bite. Being a Mexican taqueria, TDF’s menu highlights its taco offerings. 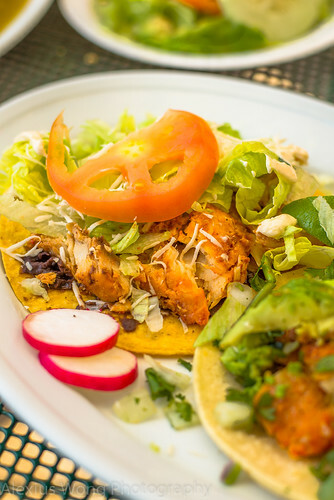 An order for lunch one day was made with the tilapia fish, tasting similar to the tostada on the same visit. Pieces of fish came sitting on a couple of small tortillas, tasting fairly fresh and with its corn notes, but perhaps store bought since it didn’t have the hand-made appearance judging by the perfectly round shape. In addition to the protein, a topping of ripe avocado slices, sweet white onion and cilantro, with a lime wedge was its simple accompaniments. And that’s all is really needed for this dish as to not overwhelm the palate with strong flavors. A friend’s order of a trio made with shrimp on another visit looked very appetizing and beautifully presented. 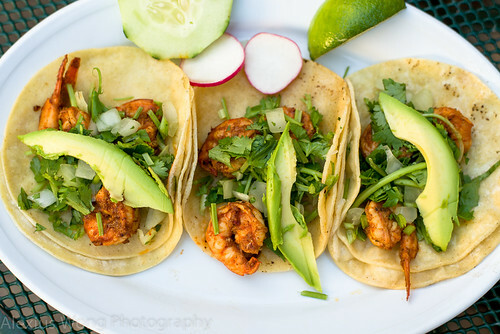 One taste of his taco pointed to fresh plump shrimp, slightly marinated in perhaps reddish achiote and a hint of chili powder. Moving beyond seafood, a dinner order made with barbacoa, goat, was a bit too much for the sitting. The pieces of meat were a bit tough, although well seasoned with achiote and chili, and it was sitting on a small pool of reddish oil on top of the tortillas. The strong flavors of this meat was a bit overwhelming and off putting. Another order on another visit was on the safer side. Taco al Pastor came with pieces of beef that was also marinated the similar fashion as above (like how it is done South of the Border, according to a Puerto Rican friend who has visited the capitol), with the cut of meat tasting well-seasoned, mild in meat flavor, and tender to the bite. 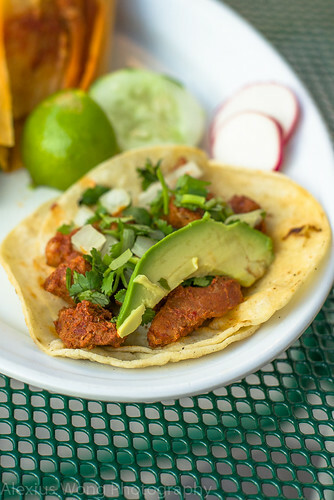 Other taco offerings are made with interesting cuts of meat, such as beef tongue, tripe, and chorizo (Mexican spicy sausage). Here there is a taco for everyone, from the risk-taker to the not-so. The special of the house is listed as Plato Especial. The plate arrived with chunks of pork ribs smothered in a green sauce, served with black beans and yellow rice. A bite into the meat revealed its fattiness and strong pork flavor, simmered in the sauce until nearly falling off the bone. But it was the sauce that made the dish, tasting tart from green tomatillos (a relative of the gooseberry), slightly pungent with a good hit of garlic and cilantro, and spicy from the use of green chilies. The sauce looked plentiful until I was searching for more spoonfuls to finish my meat off, wishing for more on the plate. The black beans were definitely house-cooked judging by its bare firmness which tasted seasoned but a bit ordinary. Not much can be said about the yellow rice, but very few places can impress me with this starch cooked this way. Perusing the menu, the weekend specials grabbed my attention immediately, and I knew I had to pay my visits on the weekend to try them. 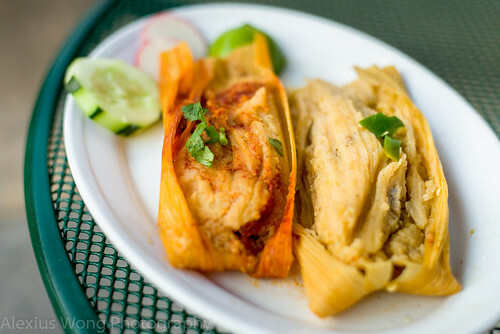 I was quite hesitant ordering the Tamales since my experience at another Mexican restaurant was disappointing and they tasted quite stodgy. My order of a pair arrived made with red sauce and green with the other. One forkful into these small bites dispelled all sense of doubt. The red version had some smokey heat from the use of dried chili sauce paired with pieces of tender pork that were well-seasoned, perhaps boiled in a good stock. 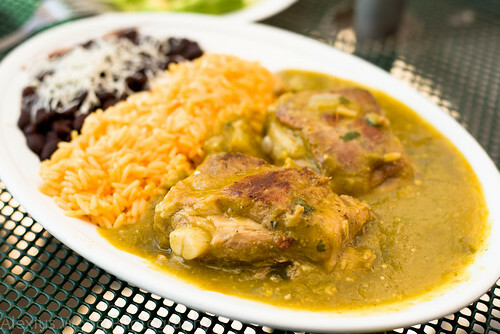 The green version exuded its green chili vegetal heat with pieces of dark chicken meat that was equally tender. But what made them very successful and extremely tasty was the light fluffiness of the dough, masa harina, tasting extremely savory with the right amount of salt and stock. The moist corn husk as their shell was indicative of them being freshly-made and steamed to order (a far cry from the microwaved version in the other place) imparting more corn goodness into the moist dough. I think I could have just had these delightful parcels as my main meal that day. The other weekend specials are soup based. 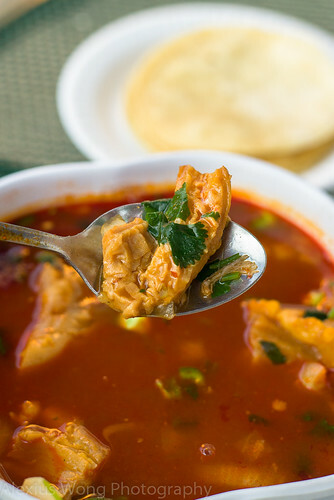 The first is Menudo, the famous, or infamous, Mexican soup. I reluctantly ordered this soup due to its reputation and my preconceived notion of what it would taste like; being known as a cure for hangover with pieces of off-cuts was not exactly its most appealing quality. My bowl arrived with a reddish soup submerging pieces of barely recognizable and unrecognizable pieces of, uhm, meat. One dip of the spoon was a revelation. The reddish soup was not spicy at all, but savory and colored by the use of achiote. Fishing around the soup, I came across pieces of tripe and huge chunks of cow feet that was a slight put-off for me, even for this adventurous gourmand. After adding some sweet onion, fragrant cilantro and a good squeeze of lime, I was beginning to appreciate the broth, which was devoid of excessive grease, and the pieces of soft tripe that disintegrated in my mouth easily. The cow foot? Nah, not for me. I prefer to leave it to the inebriated to show either their ravenous hunger or drunken stupor to muster that piece of appendage. The other soup dish was Pozole. A big bowl arrived with pieces of hominy (reconstituted dried corn) and chunks of pork, all cooked in a fairly clear broth. After my dining companion dumped in a plateful of side condiments of onions, radishes, lettuce, cilantro, cracked crispy tortilla, along with lots of lime juice, I dipped my spoon to have a taste – I fell in love with this bowlful immediately. The hominy was cooked enough with still a slight bite left, paired with the fork-tender pieces of pork, swimming in that oh-so-good broth that was clean tasting and herbaceous from a good sprinkling of Mexican oregano, possessing a slightly darker flavor than its Mediterranean cousin. 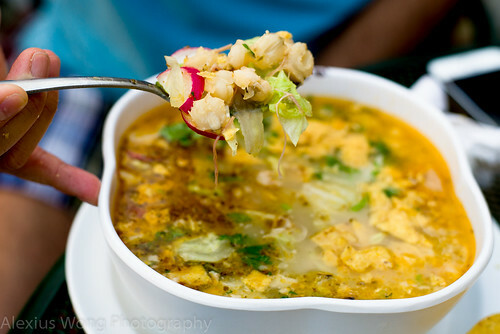 I was also enjoying the accompaniments in the soup with the onions providing a sweet crunch, the crispy tortilla for more crunch and toasted corn notes, the lime juice for citrus tang, and the lettuce and radish that brought some cooling vegetal crunch to this hot soup. Even though I had my order in front of me, I kept reaching over for more of this soup with its irresistible flavor and ingredients. It was definitely a very tasty Pozole, órale! (Sorry, I couldn’t help it). Despite the mistaken identity on my part, I’m glad I made it to Taqueria Distrito Federal for its authentic and tasty Mexican street fare that puts most places making similar attempts, especially Tex-Mex, to shame. Yes, the place is a bit of a dive and the dining area lacking in ambience. But what makes this establishment worthwhile is the dishes that are worth the trip, starting with their tacos (al pastor and the seafood kinds were my favorite), the tostadas, the ethereally light yet savory red and green tamales that raised my eyebrows, the pork house special cooked in that can’t-get-enough tangy and spicy green sauce, and that irresistible Pozole stew that just blew me away. And there is that rather funky Menudo soup whose broth was revealing but a challenge for the sober-minded diner. Instead of a trip south of the border for authentic Mexican fare, a short trip up Columbia Heights will whisk one away from the usual environment, and your taste buds will take a gastronomic journey with its authentic offerings. Buen Provecho.